I'm back. Actually, I've been back, but for the first time since I've taken a trip, I've needed to take a rest from it! New York was fun, hot and hectic. It's always good to come back, but this time I did realize that Holland is my home now, the place I want to be. The moment DD and I landed at Schiphol, we hit the ground running, she going straight to "Introduction Week" at the University of Leiden, and me off to my LQS, eager to see my quilting buddies at the monthly Bee. I wasn't sure if I was going to pop by at first, wondering if it was a good way to keep me awake a few hours, but when Diana called me and said "hey I'm in the car and on my way, want to join me?" the decision was then easy to make. 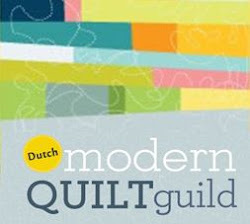 Fast Forward to the class presentations for the Fall Semester at Atelier Quiltgebeuren. It was really cool being with some amazingly talented teachers with whom I have studied under. Good fun, and exciting times to be able to share and learn about the art I'm so passionate about with others. 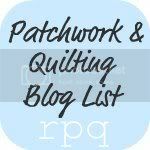 Press the Fast Forward button again, to the part where I tell you that I'm packing today, and getting my sewing basket together to head off to the 17th European Patchwork Meeting in St.Marie-aux-Mines in the Alsace of France. Seven days of quilting and good friends. What more could a girl ask for? This will be the second time for me. Wil, Janine, Diana and I sharing a log cabin house...I can't wait! Ok, can I just say it's my daughter's fault? Her eyes fell on the web page I was looking at and she just went "Awww....it's so cute, I love it!...I'd love a quilt like that...."
So now I'm making her graduation quilt. Gives me plenty of time...lol!! 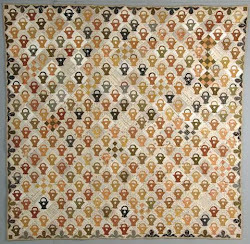 It's from the Got Dots quilt-a-long from Jovita's Patchwork. 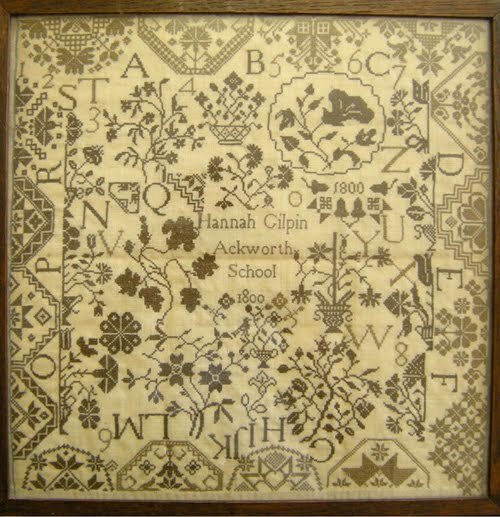 Based on a museum quilt, that you can read about on her blog, she's adapted the pattern to create a new quilt from all these little dots. I in turn, have chosen to use two of the main blocks from the quilt, but then branch out on my own to make this quilt unique for my daughter. I've prepared nine of these little blocks, and am taking them to St. Marie-aux-Mines to work on them in them in the evenings. I've prepared all the blocks and used the smallest drops of glue to hold them down. It just seemed a bit treacherous to have so many little pins in one small block! That and the first block of the Camelot quilt is coming along too...you think I'll get that much stitching done? Ha! We'll see, it's the thought that counts, right? If the stars allow, I may try to post while I'm there. Haven't tried my iPad's camera yet, so this may be a good opportunity to do so! This Got Dots is a great pattern, I just printed it off. Isn't it a good feeling when you know you are in the right place at the right time? I felt that shortly after I moved to a new town where I didn't know anyone. My life was turned upside down and spun around, and yet, I knew I was where I needed to be. Enjoy your trip to France. I am so tickled that you've started and look forward to seeing your quilt grow. I love that you're going to put your own spin on it and can't wait to see what you have in store.